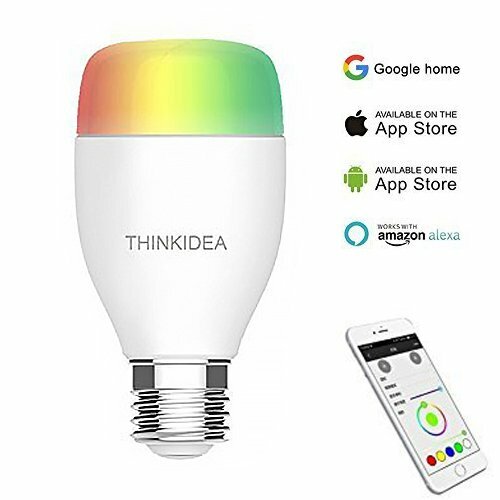 THINKIDEA smart wifi bulb will give you a Relaxing and Brilliant home,it will be a very good choice! Schedule your bulb to turn on or off at specific time. Wake up in the morning to your favorite colors. Improve your home security when you're not home by scheduling your lights to turn on and off giving the appearance that you're home. Just have your smart lights work around your life! Approximately 20,000 working hours and 6W LED saves up to 80% energy, compared to traditional incandescent bulbs. THINKIDEA smart wifi bulb has 4 scene modes to help you relaxing. 2.Night--The orange light helps sleep. 4.Leisure--Light blue light is relaxing. ★1.First make sure you can use the App updated to the latest version(version 1.2.3 or more)to control your device. .
★2.Prepare a Amazon ECHO device, open the Amazon Alexa APP, and connect your ECHO to your eFamily APP system. Note: Our wifi light ONLY SUPPORTS 802.11b/n/g 2.4GHz Wi-Fi HOTSPOT, not support 5.0GHz Wi-Fi hotspot..
【Works with Alexa and Google Home】-- The Smart Bulb support dimming through voice control. Assign a name to each smart device and communicate each device by name when making a voice command. You can change the color of the bulb by voice control. 【Multicolor and Schedule feature】--16 million colors(warm white +RGB) change, and every color is dimmable from 100% to 1%. Choose different colors to suit your mood,sleeping, watching movie or reading. You may also set up schedules to turn on/off according to the preset time. Wake up in the morning with your favorite light color. 【Remote Access】--No hub required, works with internet access, you can control your led lights at any time and anywhere with WiFi/2G/3G/4G access by using the free eFamilyCloud app on your Smartphone or tablet. (Compatible with Android 2.3 or higher & iOS8 or higher). 【Last longer and Energy saver】-- Approximately 20,000 working hours and 6W LED saves up to 80% energy, compared to traditional incandescent bulbs. it has 6500K White brightness and dimmable light. 【Satisfaction Guarantee】--If you received some damaged items, please contact us and we will send you free replacement or refund,100% satisfaction guarantee, now "Add To Cart" ! If you have any questions about this product by THINKIDEA, contact us by completing and submitting the form below. If you are looking for a specif part number, please include it with your message.